There’s a belief among the Stoics that the best way to appreciate anything is to put yourself in the mind that this may be the last time you’ll ever experience it: the last sunrise, the last ripe peach. The last goodbye from a loved one. Summer has,officially left us, and there’s every sign that she’s really on her way: the cool, crisp mornings, the way the pumpkin plants, hasty in their efforts to overburden us with the makings of pies and muffins, have finally given up their collective ghosts. School has started, of course, and sunset is encroaching a little more into each afternoon. But the days, once the chill has left the ground, are still warm and fair. The winter rains are still a long ways off, and the hills still wear summer’s robe of flax and gold. She may be leaving, but she’s not gone yet, and while I can still taste the summer in the air, I will enjoy her company. Each day with her may be our last. With that in mind, today looked like a lovely day to spend embracing our soon-to-be-departed season. Jeremy was going to be in LARP all day, Miranda was off doing whatever it is that teenagers do, and there were plenty of options for me – a hike up around Los Trancos? Devon and I had had a gorgeous one there a couple of weeks ago. Maybe a nice long bike ride nowhere in particular? Ah – I still haven’t fixed that flat tire from last week. Hey, I know! How ‘bout going flying? Yeah, it was a setup. 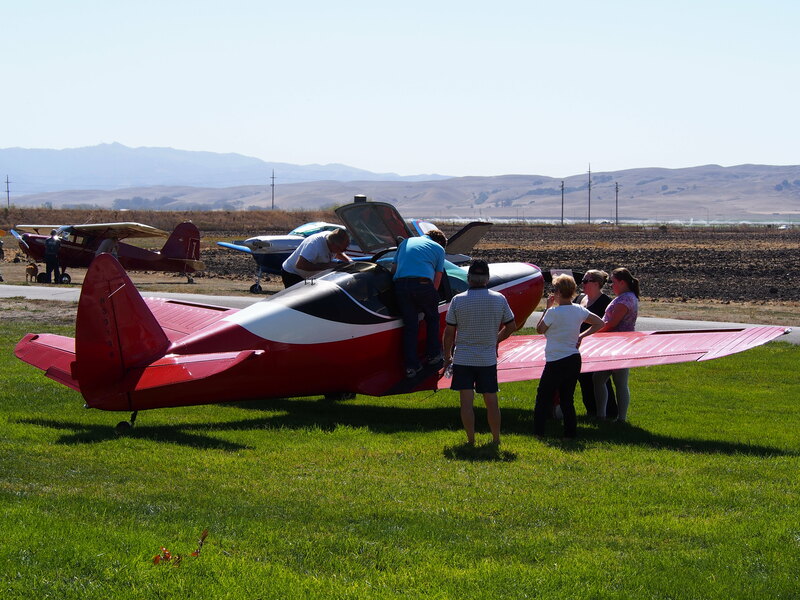 There’s a lovely little old-fashioned grass-runway airfield about 50 miles south of here, just north of Hollister. It’s called Frazier Lake Airpark because, predictably, it’s right next to, um, San Felipe Lake. Really. Honestly, I haven’t been able to figure the name out, and I’ve never gotten around to asking anyone. The nearest actual “Frazier Lake” appears to be in central Nebraska, and it’s not like the runway is long enough that the two of them could be considered proximate by any stretch of the imagination. 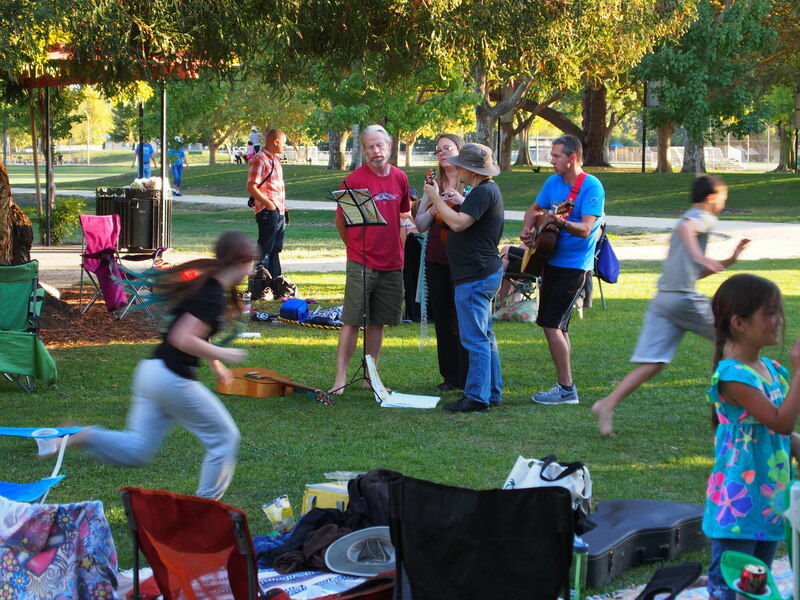 But Frazier Lake Airpark it is, and they’re known for having a little shindig the first Saturday of each month. Tucked away in the hangars north of the runway are all sorts of fabulous antique aircraft: Beech Staggerwings, Travelaires, Stinsons, Swifts, and more yellow Piper Cubs than you could shake a stick at. And on the morning of the first Saturday, everyone pulls their planes out and lines the taxiways for a show. Sometimes, as was the case today, they even set up a barbecue, with all sorts of homemade salads, pies and cookies brought in by the pilots (and, okay, let’s be honest, their long-suffering and understanding spouses). The winds were a bit squirrely yesterday. Barry and I had planned to do a bit of flying around the neighborhood in the T-6, but watching the windsock swing 120 degrees back and forth while standing straight out gave us second thoughts. This morning, however, the air hung still and silent, like it was draped over the airport. Really, it would be a shame to spend a day like this on the ground. 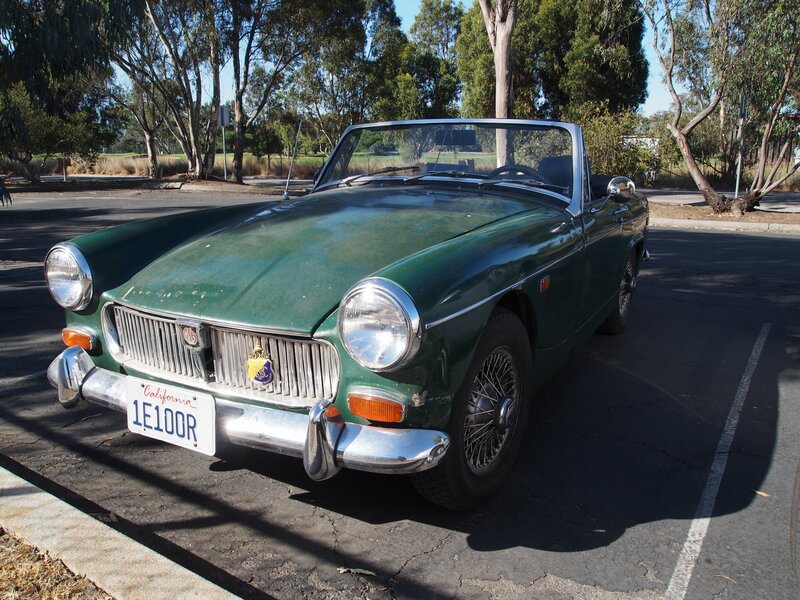 I hopped in the MG (summmmmmer! 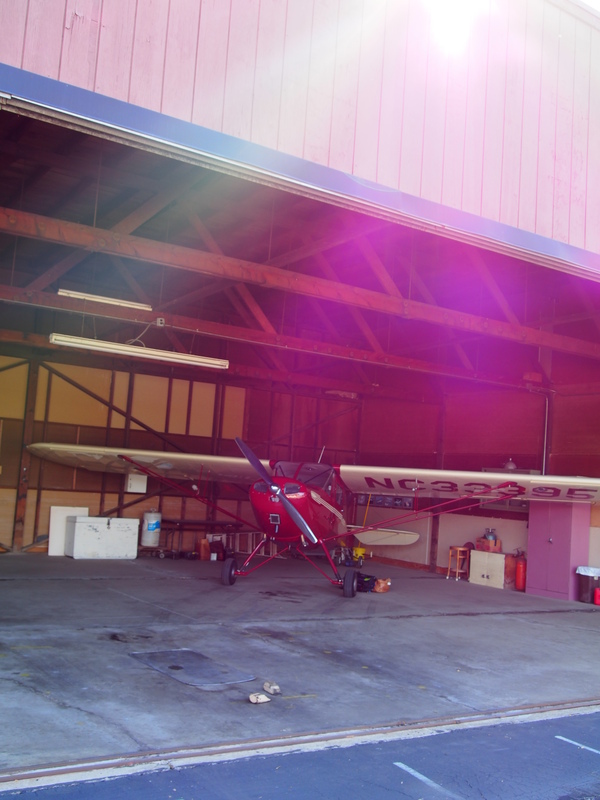 ), toodled over to KPAO and pulled our lovely little Skyranger out of the hangar. Asked tower for an eastbound departure, crossing over the bay and following 880, then 101 south into the Hollister Valley. 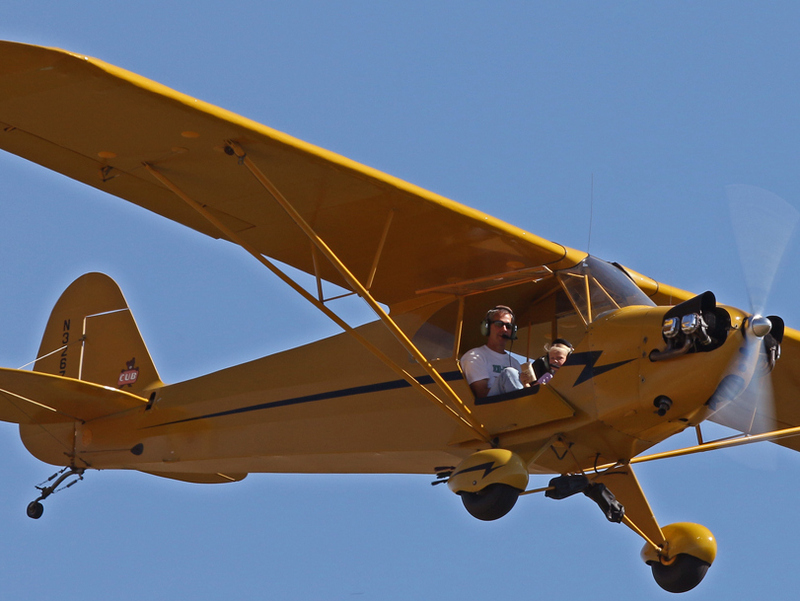 I was number three in the pattern, following an old Bonanza and a 182, and as I lined up for final I realized that ‘395 hadn’t touched grass in, well, over nine years at this point. We made a lovely, bouncy bumpy touchdown, and taxied to an empty spot at the west end of the hangars. I’d barely shut down before Tom Reeves found me. 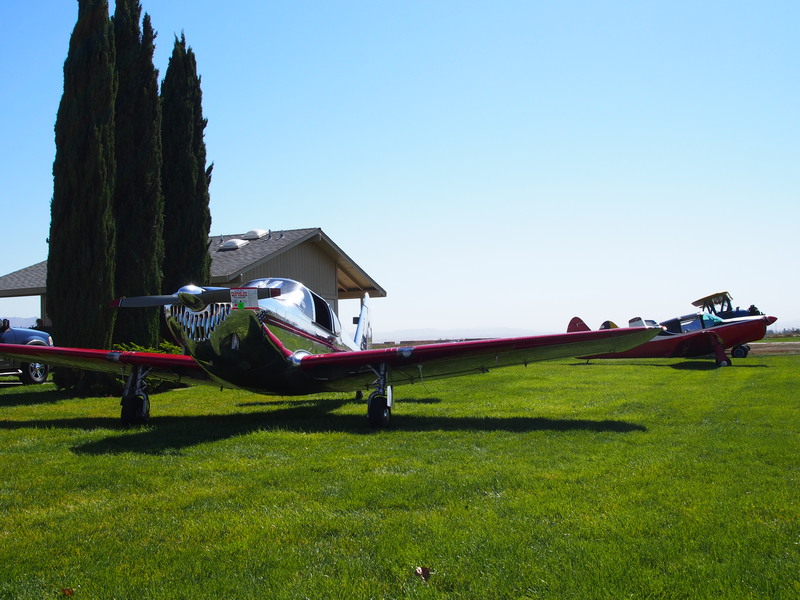 We met back at Watsonville, and he’s got a pretty Stinson 108 with a story: it was the last plane owned by the inimitable Pancho Barnes. I’d arrived just as they were starting to serve lunch (yippee! ), so we sat down and caught up over tri-tip, garlic bread and bean salad. Tom gave me the full dollar tour, poking our heads inside just about every hangar, and introducing me to all the resident pilots as “the guy who won Watsonville Grand Champion”. 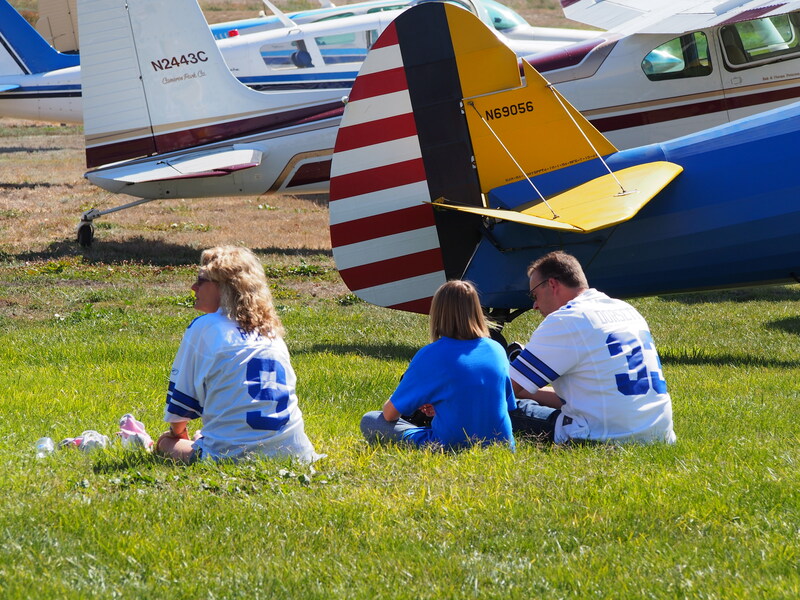 Folks had brought their kids, their dogs, and some had put picnic blankets down on the grass between the hangars and taxiway. Others were giving rides, a couple of laps around the pattern for the neighbor’s kid, or an old friend who’d stopped by. It was everything a lazy Saturday at a small-town airport ought to be. Eventually I was feeling like I ought to stop playing hooky and get back home, but it turns out that it was time for the main event of the day: the Frazier Lake flour bombing contest. Participants were each given two paper lunch bags filled with flour, and took turns overflying the runway at 200’, trying to “bomb” a red and white barrel (and two judges) standing at ground zero. Luscombes and Citabrias and Cubs launched into the pattern and swooped down, pilots holding a steady course while their bombardiers leaned out and – more often than not – missed the barrel by dozens of yards. I didn’t stay for the end and slipped out, departing west on Runway 23, during a lull in the bombardment. The ride home was idyllic. Low over the farm fields, riding the early-afternoon thermals when they cropped up. Too soon, I was back over civilization, talking to Norcal Approach. “Roger, ‘33395 – say type again? That’s a Skywhat?” They were friendly and helpful as always – even told me that they’d gone online to figure out what a Skyranger looked like – but they had their hands full with the jets coming in to San Jose and needed to keep me steered clear. Handed me off to Moffett Tower, then Palo Alto, where I capped the day’s flights off with a nicely squeaked three-point landing on Runway 31. Returned home to a scene of carefully-orchestrated chaos. While Jem was off at LARP, Devon and a half a dozen of the other parents had transformed our kitchen into the prep area for the group’s autumn fundraising dinner. My utility was limited to loading probably something like 20 pounds of steaming ginger rice into the Prius and caravaning to Mitchell Park, where the LARPers and the rest of their parents were honoring the lingering summer day in their own way. Enough food to feed an army of hungry orcs, giants, hobbits, mages, some sort of spider-warrior-things – and their parents – had somehow been created in our kitchen, and the park quickly transformed itself from yet another cataclysmic foam-sword battle into a grand feast. It was a good day. Maybe the last good day that summer will give us this year, and I’m going to bed tired and content that I’ve spent it as though it might have been. But who knows – tomorrow’s Sunday. And the forecast still looks pretty nice…. ← Best. Zombie. Apocalypse. Ever. Flour bombing! I haven’t done that in over 20 years. Last time was at the beach strip at Copalis, and it is surprisingly difficult! If Rico hadn’t been so intent on getting to the dog park we might have recognized you as we walked by. It was a perfect day for a picnic.